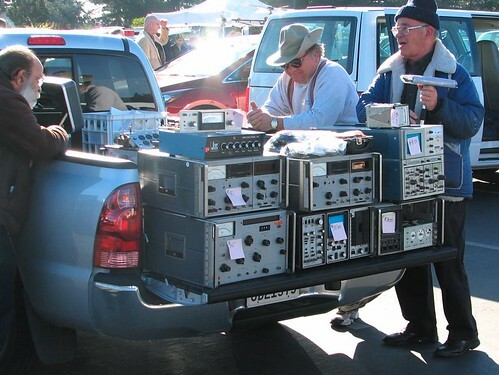 The Silicon Valley Electronics Flea Market is held monthly, March to October, on Saturday mornings at De Anza College in Cupertino, CA. Today (March 10) was the first one of the year, so I made the trip and got there early– by my standards– at 8 AM, by which time the early birds had already left. The market nominally runs from 5 AM – Noon, but it starts to wind down an hour or two earlier than that. The flea market is very popular but not crowded enough to be annoying, and it’s full of interesting characters. There are people selling things on the ground, under tents, on tables, and out of pickups, big trucks, horse trucks, Hummers, and Prii. The most common things that you’ll find for sale there are classic computers, radio equipment, electronic components (often by the reel), industrial surplus, tools, cables, connectors, books, software, and consumer electronics. Look a little harder to find esoteric components like lasers, as well as stuff that belongs at an entirely different flea market. Today I picked up three sets of fine tweezers, a giant package of (giant) rubber feet, a small metalworking file, a package of breakaway DIP headers, and two small triple power supplies (+/- 15V @150 mA, +5V @ 300 mA), a total expenditure of $12. I also took my camera with me to document some of the fun, and you can check out the flickr set here, with 61 photos in moderately high resolution. The folks in the photo above are having a great time chatting over some ‘scopes and signal generators. The next flea market is on April 14, so mark your calendar! This entry was posted in Electronics, Field Trips, Vintage Technology and tagged electronics, vintage tech. Bookmark the Permalink.